Has anyone wondered what a 'pop-up tidy' is? 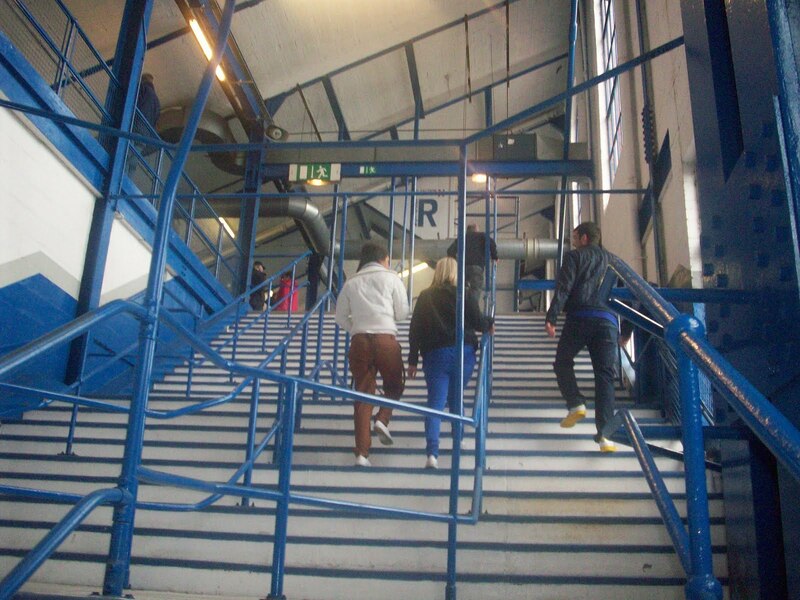 Not to worry, as always there were plenty street sellers around the stadium – actually one of my favourite features of going to Ibrox. The usual collection of hats, scarves, flags and badges were on show with home fans absolutely lapping up the overpriced market goods on offer. I was particularly interested in this item. 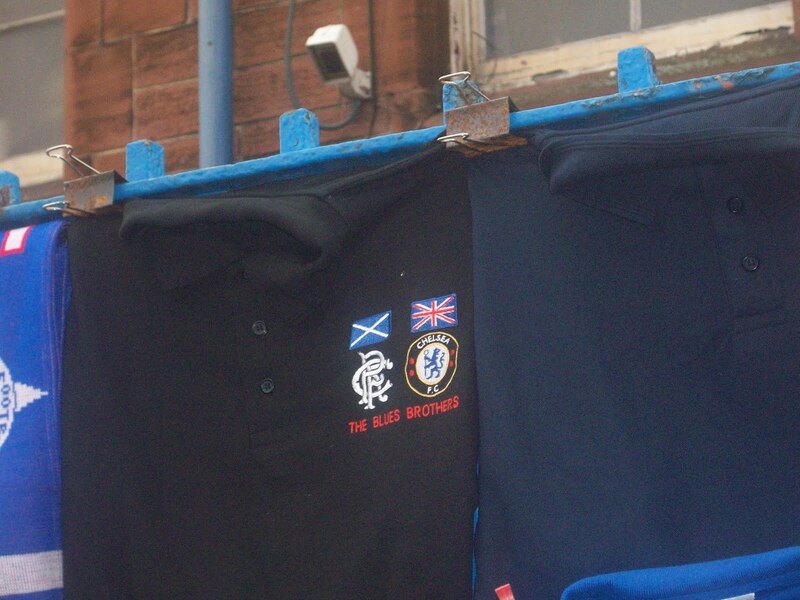 Rangers and Chelsea: "Blues Brothers"
I wonder if these are also going like hot cakes down at Stamford Bridge as well? Wander complete, it was time to make my way inside. I made my way through the turnstiles in the iconic Main Stand on Edmiston Drive using a Smartcard system – a card issued to me by the club and programmed with the necessary coding to let me into this game and, with an email confirmation, I knew where I was sitting. Nice and convenient, certainly. 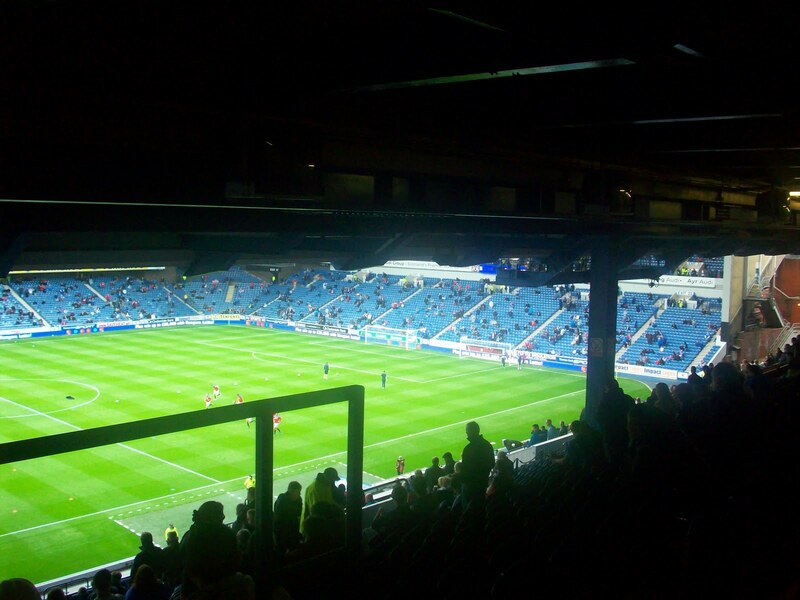 Having been to Ibrox before (but having never sat here) I was surprised at one especially quirky feature of the stand, namely that while seated you are unable to see the entire top tier of any of the other stands around you! A bit bizarre really. Even more bizarre was that on the ledges in front of me were a row of old-school televisions which looked like they’d been bought from a Cash Converters or stolen from the public skip at Shiedhall. I should say the purpose of these TVs is still unclear. The Broomloan stand was on my left, opposite sat the Govan Stand and to my right, the Copland Road End. The half time show was quite entertaining though. 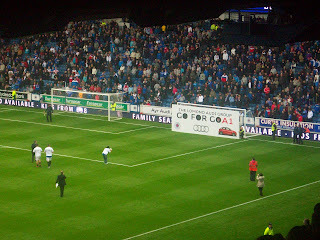 Basically, three fans came out on the pitch and got one chance to smack a ball through a hole, with the prize a brand new Audi A1. I’d be WELL up for this at my work. I might have to suggest it to the boss at the next team meeting…. One thing I did find curious was the selling machine that is the stadium announcer. Between 2.30 and 3pm kick off I counted four separate mentions of how you can go about buying a season ticket (including payment plans!) 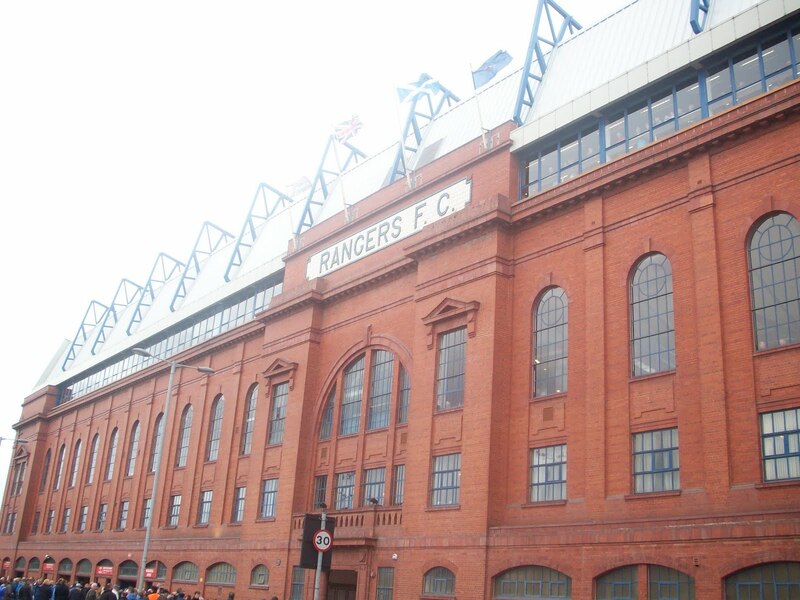 – not to mention the further two mentions at half time, the plug for Rangers’ MasterCard and.....the Junior Rangers club......again including payment plans! 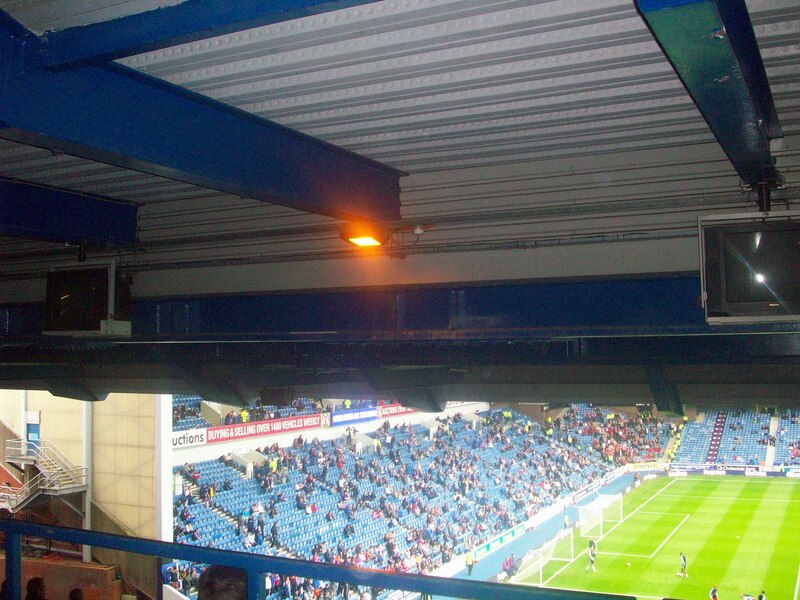 I had read before the game that Craig Whyte had spent a considerable sum of cash on upgrading the catering facilities to improve the match day experience of fans. Well, Mr Whyte, you have either not started on the Main Stand as yet or, you’ve been taken for a mug because the catering at Ibrox was atrocious. A pie and a cup of tea was a pricey £4.00. The former was more than a little bit ropey; the latter looked like a pot of water that had lovingly soaked a couple of paint brushes overnight. Basically, grey and pungent. Very disappointing. I did expect a bit more. Rightly or wrongly, Rangers fans (like their counterparts across the city, before anyone thinks I’m picking on one more than another!) have a certain reputation for nonsense – a bit of bigotry and an aggressive nature. Based on my experience at this game, this generalisation is extremely unfair with the lads around me extremely warm, welcoming and kind. Full of the banter in fact. Definite plus points. These “Ultras” (they actually call themselves this by the way) were instead blasting out “God Save the Queen” in defiance as the travelling Dons sang “Flower of Scotland” without scarf waving of any kind. Something I found a bit more disappointing was that the fans seemed completely unwilling to demonstrate sportsmanship in any way, shape or form. Sizeable parts of the second half saw Aberdeen play some excellent football and, while nobody's asking people to stand up and applaud your opposition, showing them a bit of respect wouldn't have been too much trouble. 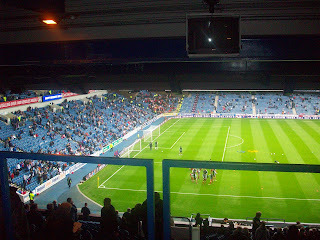 A bit too often (for my liking anyway) cries of “Rangers, these guys are sh!te, get intae them” and so on were bellowed around me. Unfortunately, this was not an entertaining experience. In fact, but for the outstanding performance of Steven Davis, the occasional touch of class from Nikica Jelavic and the direct running of Gregg Wylde, this section would have scored even lower. 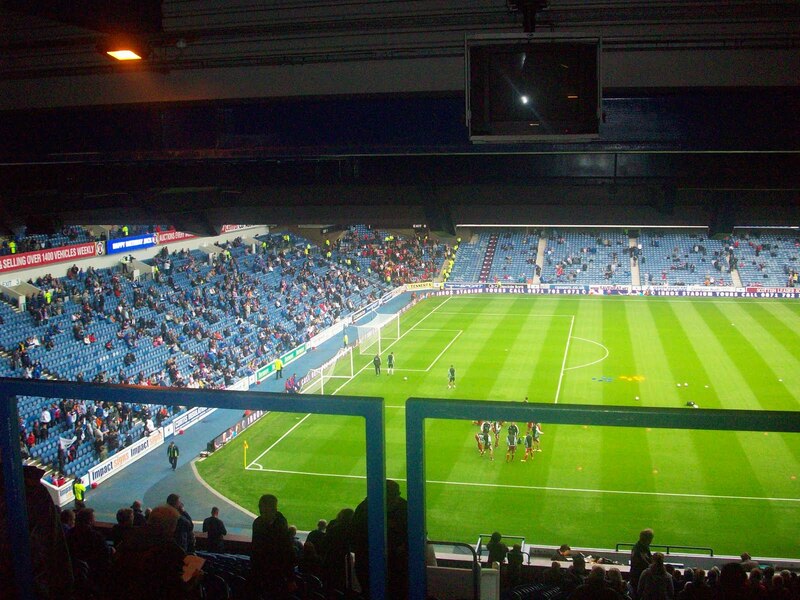 Considering the comparative amount of money that Rangers have spent on the park, passing the ball along the ground in the way their guests did seemed an alien concept. Time and again, if Davis wasn’t free, Rangers would just go long, looking for Lafferty or Jelavic and hoping something came from the knock downs. 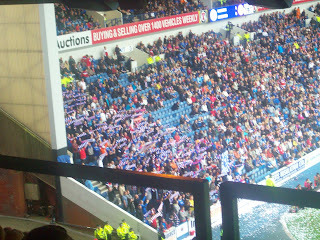 Rangers are our Champions, and so it was a bit of a shame they didn’t entertain slightly more. Steven Davis is a quite superb footballer. 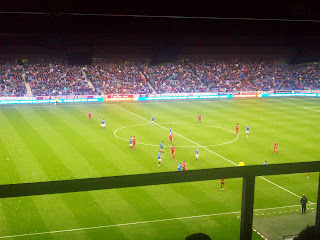 Dynamic, fantastic in possession and box to box, he dragged Rangers through this game – and scored a cute goal to boot. Nikica Jelavic - you only really see in the flesh what an intelligent player he is. His movement is phenomenal, only bettered by his all round game intelligence. And other than the exciting Gregg Wylde (who could do with learning some of that game intelligence from Jelavic) once again Allan McGregor was in outstanding form, pulling off a couple of incredible saves. First class keeper. 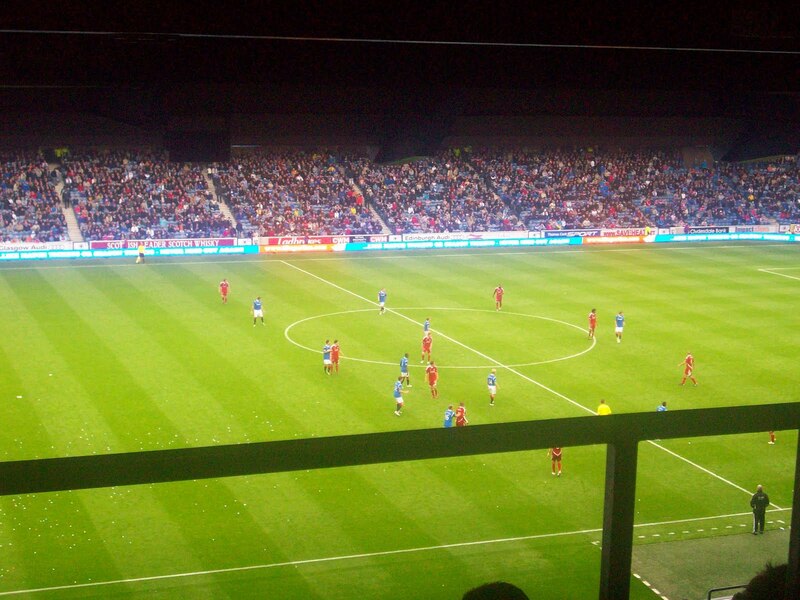 On the other end of the scale, I have great sympathy for Rangers fans that have to go along every week and watch Maurice Edu. The boy tries hard, don’t get me wrong, but more often than not it looks like the other 10 boys have turned up, looked around, seen they are missing someone and picked Mo out of the crowd to fill the 11th space. Getting in to see Rangers cost me nearly three times as much as it did to visit Stranraer, Albion Rovers, Alloa and the likes. Is it three times as much fun? Absolutely not. 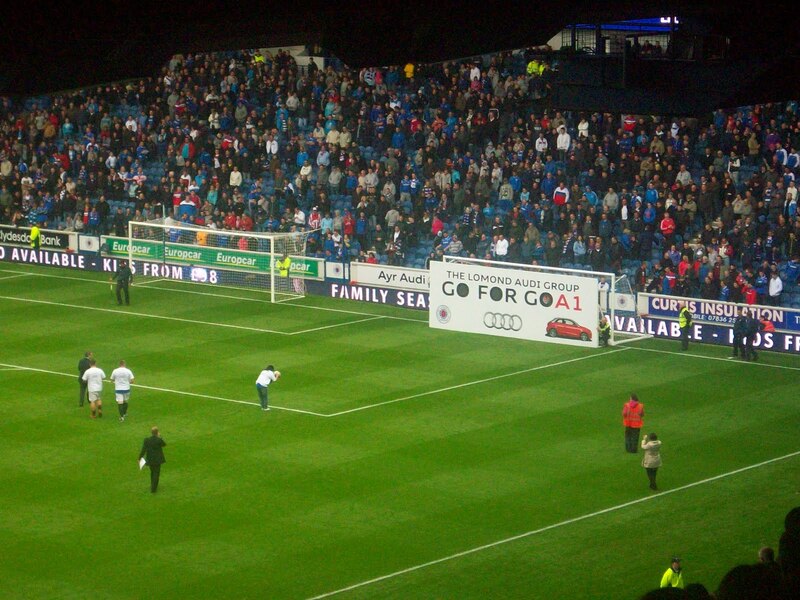 On this evidence it would be difficult to argue that fans get value for their money at Ibrox. The opportunity to see the likes of Davis and Jelavic would be worth an entry fee alone….but only if the entry free was less than £30! Factoring everything in…..Rangers score a bit more than half marks but it’d be difficult to award them much better considering the comparative value elsewhere.